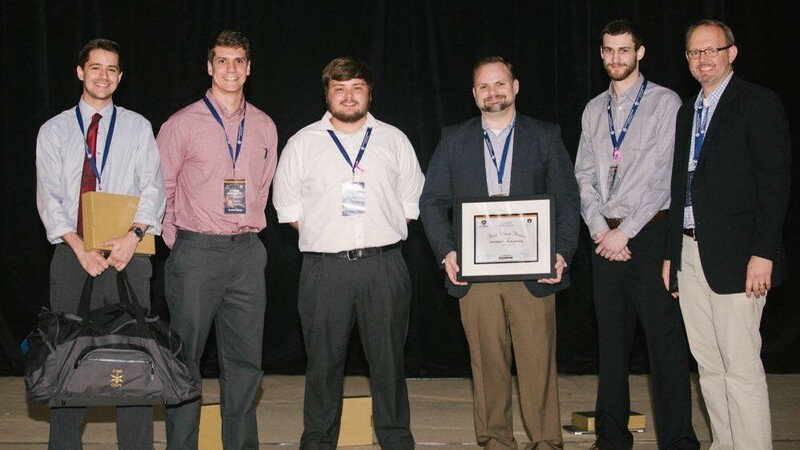 AUBURN, Ala. – The University of Alabama won first place in the SEC Student Cyber Challenge at the 2018 SEC Academic Conference being held at Auburn University and entitled Cyber Security: A Shared Responsibility. Members of the winning team were Kevin Poorman, Austin Lucas, James Woods and Austin Hose. The competition highlighted a real-world cyber security problem presented by Equifax, and teams had nearly 48 hours to develop a solution in a “hackathon” style challenge. Each SEC university was eligible to enter a team, which could include graduate and undergraduate students and required faculty oversight. To kick off the challenge, executives from Equifax, the Atlanta-based global information solutions company, explained the simulated problem, and teams then worked at their own pace to devise a solution. Their final submissions were judged by Equifax and other industry experts who ultimately selected Alabama as the winner for the team’s innovative offering. “This was a great learning experience. We brought different things to the table, and it was interesting to see how my teammates could help me learn about how networks connect and talk to each other. That was really fun, said criminal justice major, Kevin Poorman. The University of Missouri finished second in the competition, followed by host Auburn. All three teams received prizes from Equifax. In addition to the cyber challenge, students were also invited to present their cyber security research during the poster exhibition. The posters were judged by all conference attendees and members of the event advisory board, and the top three submissions were announced during the awards ceremony at the Auburn Arena. Grant Hernandez from the University of Florida won the top award, and his poster was titled “Attention Spanned: Comprehensive Vulnerability Analysis of AT Commands within the Android Ecosystem.” In second place was Dave “Jing” Tian, also from UF, with a project called “USB Security: Attacks, Defenses, and the Future.” Lastly, a five-person team from Texas A&M University finished third. Ending on Tuesday, April 10, the SEC Academic Conference included sessions on computer and communication technology; the economic and physical systems that are controlled by technology; and the policies and laws that govern and protect information stored, transmitted and processed with technology. It is one of several programs designed to showcase the academic achievements and accomplishments of SEC administrators, faculty and students. Below is a list of the winning SEC Student Cyber Challenge teams and the poster exhibition winners.